The newest Mac operating system, macOS 10.12 Sierra, goes live later today. The big question is, does Lightroom work? The good news is Lightroom CC 2015.7 and Lightroom 6.7, which are available right now, do work on Sierra. It’s possible that there are minor issues that haven’t been spotted yet, but it has been through extensive testing on Sierra and the known issues have been fixed. If you upgrade to Sierra BEFORE updating to 2015.7/6.7, some Import dialog panels are missing. 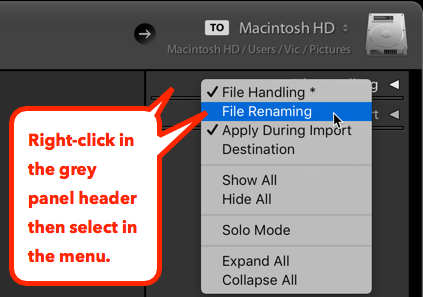 Right-click on the File Handling panel header and reselect them from the menu (see screenshot below). In the Import dialog, the Apply During Import and Destination panels are not visible. Canon cameras are not detected for tethering. Nikon cameras may also have issues. The message “Modify Exposure with +/- keys” is displayed during every launch. Right-clicking to access context menus anywhere in Lightroom throws an uncaught exception. To update, go to the CC app and press the Update button, or go to Help menu > Updates from within Lightroom. Older Lightroom versions are not supported, and will not be updated. They haven’t been extensively tested, but I upgraded to Sierra 10 days ago (developer’s GM build) and have done some initial testing. I’ll add new issues to this list as I hear about them. LR 3, 4, 5 – In the Import dialog, the Apply During Import and Destination panels are missing. To show them again, right-click on another panel header and reselect them in the menu. LR 3, 4, 5 – Canon, Nikon and Leica tethering do not work. If you want to upgrade to Lightroom CC/6, to help you decide whether to upgrade to a subscription or a perpetual license, there are pros, cons and purchase links on my How to Buy Lightroom page. I lost those same 2 dialogues windows for importing while doing Beta testing for Sierra Beta but I was able to get them back. It really freaked me out because Adobe messed with the import function awhile back so I was worried they were up to something again. So I worriedly clicked all around and couldn’t get them back. I made a few posts and finally had someone suggest something I didn’t new existed. You can turn off those windows in importing just like the windows in the develop module. All I had to do was right click one of the windows and select the ones that were off. Oh well spotted Mark. For some reason that wasn’t working when I was testing before, but I can confirm it’s working now. What is the deal with Duel Pixcel RAW Victoria on the Canon 5D Mark iv? Is it not supported? The files are supported for normal raw conversion, but Lightroom can’t do any of the fancy pixel shifting that Canon’s DPP software can do (yet?). I have a new iMac using El Capitan and whenever I use CC for LR and PS and I use the brush tool, my screen starts blinking over and over again. 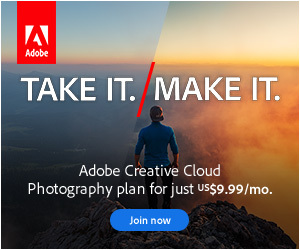 After spending over 10 hours on the phone with Adobe, it is still an issue. Does anyone know why? Maybe the Sierra update will resolve my problem! Sounds a bit like a problem with the graphics card, but report it at the Official Feature Request/Bug Report Forum at http://feedback.photoshop.com/photoshop_family so the engineers can investigate. 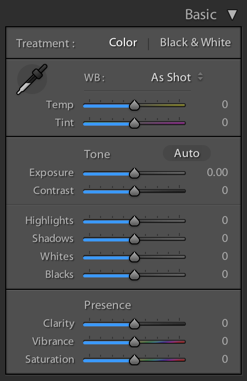 I have tried running Lightroom 5 on MacOS Sierra and am not seeing some of the issues noted, such as the slider issue and modify exposure. If I carry on using it am I at risk of corrupting the catalog or are the issues above some cosmetic anomalies? Or would you suggest I err on the side of caution and upgrade LR to version 6 – although I am quite happy with v5 and can run it on another mac that still uses El Capitan? I just upgraded to Sierra and every photo in m entire catalog lost quality. Most specifically regarding the dark blacks/shadows in my images. They all became choppy/gritty. Does anybody know how to solve this? Please let me know!!!! That sounds like a problem with the monitor profile. Try recalibrating your monitor, and set it to a Matrix profile, not LUT, if you have the choice. It would be a setting in your monitor calibration software (e.g. i1, Spyder, ColorMunki) and it might be marked as Version 2 (which is Matrix) vs. Version 4 (LUT). Hi! I have the same problem, but only in the “develop” mode of lightroom, pictures show the correct colors and quality on the “library” mode. I have no idea how to solve this. I’m using lightroom 4. Exact same problem! Did you fix it? I am having this problem and calibrating the monitor did not help! Did you figure out how to fix it? Are you updated to the latest Lightroom release AJ? Go to Help menu > System Info and tell me which version you’re on then. There doesn’t appear to be any risk of corruption, so if you’re happy, you should be fine. I have the latest version of LR 5.6 and since upgrading to Sierra I have the same issue with the develop mode not working at all. The images are posterized and completely useless. Can this really be a monitor calibration issue? This is my first post so apologies if you have said all this. Have been tearing my hair out – what’s left of it – with Sierra and printing issues with my Epson R1800 and Photoshop. Sometimes it works but mostly it doesn’t and Photoshop quits on the print command – but not always!!! No probables with Lightroom printing but that’s not always how I want to do things. I know the printer works fine because it prints other documents and it worked fine before Sierra. Have tried all sorts of work arounds but none fix the issue. So I was kind of glad to see it mentioned in your blog – at least there is one comfort in known ng that it’s not really something I’ve altered but i hope they fix it soon. Not sure if this applies to you but I had a problem where Photoshop would not print. I used LR until the next update and when the problem still persisted, I called Adobe support. The problem was resolved after about an hour. There was some sort of remnant of a previous version that needed to be deleted. I have an Imac and the Lightroom/Photoshop cc package and am running El Capitan. If I update my IMAC to Sierra do I have to reinstall all my third party plugins??? I didn’t need to, although obviously I can’t offer any guarantees, as I don’t know what you’re running. JD Thanks for your comments. I will hope that the next Photoshop upgrade sorts out the problem with itself and Sierra. I have uninstalled and re-installed Photoshop but to no avail and tried any number of suggested online ‘fixes’ but the print still crashes. 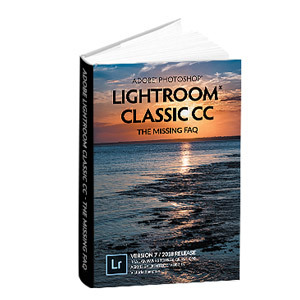 In the meantime I will have to adjust to printing through Lightroom which seems to work but I am not yet familiar with the print options in Lightroom so it’s time to read up Victoria’s advice on this. Still having print quitting problems with Sierra and photoshop. I upgraded to Sierra 10.12.1 as this was a suggestion on the Adobe site and thought the problem was solved as the first print went through OK but the second did not so clearly it’s not fixed. And although I have calibrated my monitor the colours are no longer good so something has happened! My current workaround is to create the images in Lightroom and photoshop then print them through the iMac’s print facilities which works with the Epson R1800 without a problem at least without quitting. So the problem has to be with the interchange between Photoshop and Sierra as far as my limited understanding of the problem. Lightroom 2015.7, CC does not list it as having any new versions so this must be the latest. Nikon NEFs on D800 are no longer seen by Lightroom since Sierra update a few days ago. I must use Apple Image Capture to move the photos onto the Mac. I’ll try to figure out how to get them into Lightroom later. Are you using a card reader or camera cable? 2015.7 is the latest, but that’s not a known issue. I want to upgrade from Lr 3 to Lr 6 to my Macbook Air. The OS was recently upgraded to Sierra. I subsequently read that it is preferable to load Lr prior to upgrading the OS. Should I be concerned about proceeding with the Lr upgrade? Should I expect to encounter any significant issues? Any suggestions on how to minimize potential problems would be greatly appreciated. That’s fine. Worst case scenario, the panels will be missing from the Import dialog and you’ll need to reset preferences. It’s quick and easy to do. Thanks Victoria for the quick and reassuring response. Any Answers anybody? getting really fed up now…. Can’t be read more frequently means can’t be written – aka a folder permissions error. How do I make that correct then? I have recently upgraded to Lightroom CC (2015.8) running on a pre-existing Mac OSx Sierra (10.12.3) and have encountered a very frustrating issue trying to work with two monitors (one on my Macbook Pro 13″ Retina, the other an external 27″ Lacie). When I put my main window on the secondary LaCie monitor for whatever reason parts of the user interface are clipped. For example, the top 1/6th or so of the film strip including the control buttons for the secondary monitor are clipped off (not visible), as well as the “Import”, Export (on the bottom of the left tools column) and the “Sync” and “Sync Settings” buttons (on the bottom of the right tools Column are clipped at the bottom. Is there a preferences file that I can reset to fix this? Any Ideas? I have searched the internet but have found no references to this issue anywhere. Anything you can do to help or any suggestions you can make would be greatly appreciated. Hi, I just upgraded my MacOS to Sierra and now when I open lightroom to import images there isn’t a dialogue box for naming my files! I update my lightroom (from adobe cloud) to 2015.9. Any ideas how I can fix this? I tried right clicking on “Apply During Import” and “file handling” but can’t find it! I tried the preferences reset but no luck! The only panels I’m getting are File Handling and Apply During Import – which only has Meta Data and Key words. My LR is from CC and it’s .9 just updated yesterday. I’m at a loss now and not sure how to proceed as I use it for tether shooting and need to be able to name and date files! Take a screenshot Graham, and post it on the forum at https://www.lightroomforums.net. Where do I upload the screen grab? I registered and it just took me to a general forum page? Just create a new thread, maybe in the Managing Photos & Videos section. It’s just because the thread comments here won’t allow uploads. Okay thanks – just posted. 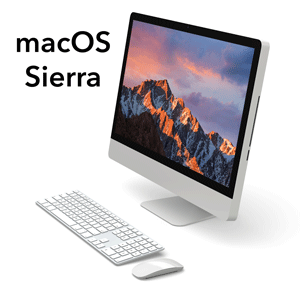 FYI I’m running LR5.7 on a mid 2011 iMac and just upgraded from OSX 10.9.5 to the latest OSX Sierra 10.12.4 last night. I didn’t get the problem with the missing windows in the import module, or the message “Modify Exposure with +/- keys” on startup, and the sliders look fine. I don’t shoot tethered so can’t comment on whether that issue is still live. Good to know. How’s the import dialog? Missing panels there? What about Lightroom 5 and MacOS High Sierra? The LR issues are listed under Older Lightroom Versions above. I only found issues for MacOS Sierra. But I was asking about the upcoming macOS release “High Sierra”. Do you have any information about that? Ah, sorry, I missed High Sierra. High Sierra’s not officially released yet, so it won’t have been tested yet. I’ll post a blog post with known issues when it’s released though. It’ll be all of the issues above, plus possibly a few more. Just missed a few heartbeats when, since upgrading to High Sierra, LR crashed every time I tried to open it from the icon in the dock. I sorted the problem out by unticking the “keep in dock” option, then opened it from within Adobe CC then re-ticked the “keep in dock” option. Phew! 😉 Here’s the High Sierra blog post: https://www.lightroomqueen.com/lightroom-macos-high-sierra-compatibility/ 2015.12 is the latest version. How do I get 2015.12? It’s not showing in my CC panel. Uninstall/reinstall usually does the trick. I’m using Lightroom 4 and just upgraded to Sierra. I now cannot see any photos in my Lightroom library. Nothing else in Lightroom works either. The library is just completely gray. I’m worried I’m never going to see my photos again. Help! 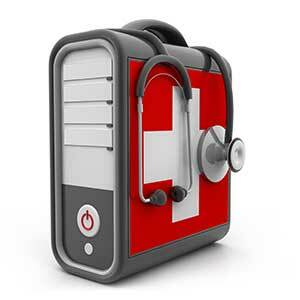 Post it on https://www.lightroomforums.net and we’ll help you troubleshoot Kristen. Hi. I just upgraded to Mac Sierra, and I am running Lightroom 5.7.1. I am now unable to import photos. I get the message “The following files could not be imported because they could not be read”. I followed the link (as above: https://support.apple.com/kb/PH25287?locale=en_GB) to check permissions and everything looks correct “Read & Write”. Not sure what to do at this point. Any suggestions? Thank you. It’s likely to still be a file permissions problem, as that’s generally the cause after an OS upgrade. Look at the file permissions for the destination folder as well as its parent folders. You could also test importing to somewhere like the Desktop. Yes, it turns out it was a file permission problem, as you had said. I had to install a new Paragon NTFS Driver in order for the new OS to allow me to write to my Windows NTFS formatted external hard drive. Now it works! Thanks!